Widening the building to the south takes advantage of the existing foundation system, as well as reinforcing the proximity of the Herschler Building to the Capitol. Replacing the exterior of the Herschler Building provides an opportunity to expand the building and remove the underutilized atrium on the north side of the building. Removal of the atrium improves energy efficiency, reduces noise, and restores Capitol views from the north. The original design called for a four-story addition on the north side of the building. However, based on preliminary design work, the option came in about $31 million over budget and did not provide efficient office space. The new design uses existing foundations to expand the building to the south, providing a more efficient method of adding square footage at a lower overall cost, with approximately 49,000 useable square feet gained. The original slab foundations are large enough to accommodate widening of the two Herschler Building wings by approximately 15 feet, which is a more cost-effective solution to gain useable square footage. Expanding to the south does not encroach on the adjacent neighborhood north of the building. Office space in the Capitol will be displaced by new building systems and larger public meeting rooms. The offices displaced from the Capitol need to be located in close proximity to support efficient operations. Expanding the Herschler Building to the south provides the space and proximity needed for elected officials’ staff. The previous design located the elected officials’ staff in an addition near 26th Street. The Treasurer will be able to co-locate staff and will no longer need to lease space for a portion of staff. The Department of Education staff will be co-located with the statewide elected officials’ staff in the building. Legislative committee chairmen and legislative staff will be located in the expansion for proximity to the Capitol and public meeting rooms. The remodeled and expanded Herschler Building will provide more efficient and flexible office space for agencies and relieve a portion of the State’s lease burden in Cheyenne in the future. Expansion of the building now will allow the State to finish out interiors as funds are available to move agencies out of leased space. The space that will be occupied by the elected officials, legislative committee chairmen and legislative staff will be finished first. Agencies that need to be located in close proximity to the Capitol will be the second priority and the third priority is to move General Fund agencies currently in the most expensive leased space. The State leases about 286,000 square feet of space in Cheyenne, spending over $5 million annually. Approximately $230,000 is spent annually for 14,000 square feet for General Fund agencies. Approximately $2.8 million is spent annually for 155,000 square feet for federally funded agencies. Approximately $2 million is spent annually for 117,000 square feet for agencies with other funding. 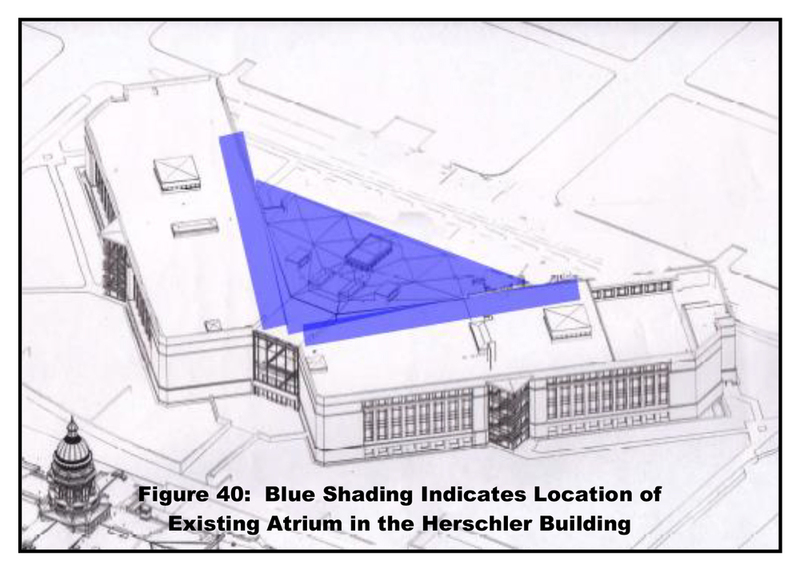 The current design of the Herschler Building is comprised of two office building wings connected by bridges and an atrium. The open floorplan allows individuals to wander throughout the building. This design results in significant inefficiencies. These issues are resolved by removal of the atrium and bridges, enclosure of the north walls of the building, and the addition of a one-story lobby connecting the building wings above grade. Removal of the atrium and enclosure of the north walls will reduce noise that travels up through the atrium during events in the terraced areas on the ground level. By enclosing the north walls and adding windows, more light will be available into offices on each floor. Removal of the atrium will restore the view to the Capitol on the north side of the Herschler Building, emphasizing the status of the Capitol as the most significant building in the state. Removal of the atrium increases building efficiency and will reduce heating and cooling costs. Enclosure of the north walls and removal of the bridges that connect the two wings will increase security in the building by creating enclosed office suites. The plaza between the Capitol and the Herschler Building will become a more inviting space for the public and entry to the building is protected from the elements by a one-story lobby that will connect the wings. Project structural engineers have determined that no increase in wind-resisting structural systems is required because of removal of the atrium. If the atrium is not removed, the floor would need to be raised and ramps and railings added at a cost of approximately $2 million to accommodate the auditorium in the Capitol Extension directly below the atrium.